The TRC started around 2005 with money, books and computers donated mainly by the Presbyterian Church of Australia. Today, the centre has over 4000 theological books that are appreciated by the theological students from around Blantyre. The IT room has 10 PCs connected to the internet. The TRC also has a spacious and well furnished seminar room and a study room, both are available to rent for a fee. To generate income the centre rents out 10 rooms (bedsits) at the rear of the centre and a 2-bedroom flat. This year, 2011, the TRC has renewed the partnership it had with the Presbyterian Church of Australia. The Library contains various theological books: sermons, apologetics, the history of the church, biographies, etc. 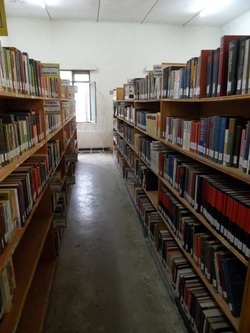 Currently the catalog consists of around 4000 books. The membership fee is MK1000 per month. 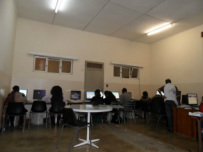 The IT Centre has 10 PCs all with Microsoft suite, Photoshop and access to internet. There is also a printer and a scanner. Matthews Jolamu is the IT person in charge of keeping the computers in good working order. He is also teaching computer skills at the centre. However if you are a church elder or involved in the church contact the centre as better rates for monthly users are available. The TRC organises IT courses for beginners that teach students how to use Word, Excel, PowerPoint and how to browse the Internet. The course takes one month to complete with sessions in the morning and afternoon. The cost of the course is MK 40,000. On completion, students will receive a certificate. The seminar room is available for rent at MK 7,500 a day which for 20 participants: Study room also available to rent at MK1000 per month.